Savvy travelers know Nanjing as a hidden treasure, offering an array of rich historical and cultural sites for visitors to explore. Located in Jiangsu Province just outside of Shanghai, this city of more than 8 million sits along the Yangtze River, with the majestic Purple Mountain rising in the east. One of China's four ancient capital cities, Nanjing enjoys a relaxed pace compared to mega-cities like Beijing and is easy to navigate, with modern public transportation and plenty of taxis. Once you’ve enjoyed Nanjing's cultural traditions and historical attractions, relax and enjoy the remarkable hospitality and incredible food. 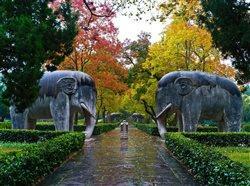 Here are a few highlights of the perfect Nanjing travel itinerary. Nanjing is one of China's most significant cities, having served as the capital of 10 Chinese dynasties and regimes over 1,800 years. Located in the Purple Mountain scenic area, the Xiaoling Tomb of the Ming Dynasty is one of the largest imperial tomb complexes in China and mausoleum of the dynasty’s founding emperor, Zhu Yuanzhang. When approaching the tomb, be sure to see the half-mile long Sacred Path, guarded by four pairs of stone warriors and 12 pairs of mythical creatures. Also constructed in the Ming Dynasty (1368-1644), Nanjing's City Wall was once one of the longest city walls in the world. More than 15 miles of the wall are still intact, welcoming visitors from around the world. In Nanjing’s walkable downtown area, the Presidential Palace is a massive compound where Chinese revolutionary Sun Yat-sen was declared the first provisional president of the Republic of China in 1912. It later served as headquarters for Chiang Kai-Shek’s Kuomintang government (1946-49). 2. Revel in the culture. Nanjing Museum is one of the first museums established in China and is still one of the country’s largest. Visitors explore exhibits ranging from ancient civilization through the early days of the Republic. Nanjing is home to distinctive folk arts such as Nanjing Cloud Brocade, one of the most exquisite and sophisticated weaving methods in Chinese history, dating back 1,600 years. At the Cloud Brocade Museum, visitors watch expert craftsmen weave the intricate textiles, incorporating materials such as silk, gold, silver thread and peacock feathers. Visit the Nanjing Folk Museum to see traditional handicrafts such as Chinese puppet shoes, clay figurines and paper cuttings. Visitors can watch handicraft demonstrations or participate in workshops to learn the techniques. 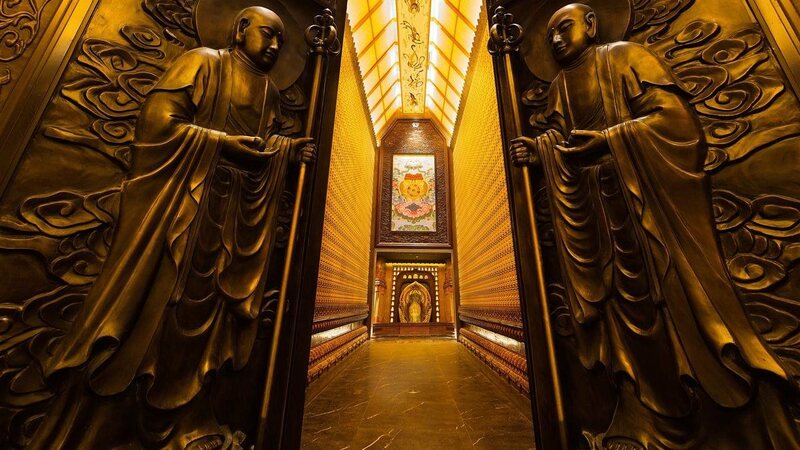 Explore the rich Buddhist traditions of China at Nanjing Niushoushan Cultural Park, a centuries-old sacred site that contains an opulent palace built into the side of the mountain. 3. Take part in a festival. Plan your visit in February or March, and you may see countless red lanterns lighting up the streets near the Confucius Temple during the Qinhuai International Lantern Festival. Dates are based upon the lunar calendar and change annually. In late February through mid-March, enjoy the Nanjing International Plum Blossom Festival, showcasing 35,000 beautiful plum trees scattered throughout a 250-acre park on Purple Mountain. In June, the Nanjing Dragon Boat Festival hosts dragon boat races, with festivities including traditional food such as zongzi — rice dumplings with nuts, wrapped in bamboo leaves. September and October mark the Hairy Crab Festival, celebrating the peak time to enjoy the delectable crustaceans from nearby Gucheng Lake. The Qinhauai Scenic Area is a must-see, including gardens, historic architecture, shops and the breathtaking Confucius Temple. Take a leisurely boat cruise on the Qinhuai River to admire the sights while you enjoy local snacks and listen to traditional music. Xuanwu Lake Park is a former imperial lake garden showcasing a distinct color for each season: pink cherry blossoms in spring, emerald lotus leaves in summer, golden ginkgoes and red maples in autumn and snow-covered pines in winter. Discover Nanjing’s culinary scene, known for refined dishes that focus on seasonal ingredients while balancing taste and color. Nanjing is famous for its duck, as well as river fish and shrimp. Nanjing salted duck is the city’s signature dish. Other popular choices include Peking duck, pan-fried beef dumplings, pidu noodles, soup buns and sesame pancakes. You’ll never run out of options to try when exploring Nanjing’s exciting, delicious cuisine. Visiting Nanjing is easier than you can imagine. Nanjing Lukou International Airport is 40 miles from the city center, and nonstop flights are available from several North American gateways. Many visitors travel by bullet train to Nanjing, as it is 3 1/2 hours from Beijing and just 90 minutes from Shanghai. More than 100 hotels offer a variety of options, from budget to luxury accommodations, including international brands like Jumeirah, Fairmont, Shangri-La, Hilton, Sofitel, Renaissance and Westin. Make your trip to China memorable by exploring all it has to offer — through the vibrant, historic city of Nanjing. Ready to plan your Nanjing experience? Visit gotonanjing.com for more information. China’s hidden treasure, Nanjing, offers rich history and culture, plus amazing hospitality and cuisine. History. Nanjing was the capital of 10 Chinese dynasties and regimes over 1,800 years. The Xiaoling Tomb of the Ming Dynasty is one of the largest imperial tomb complexes in China and mausoleum of the dynasty’s founding emperor. 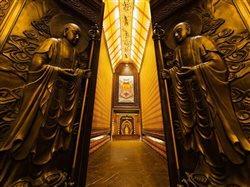 Nearby, visit the half-mile long Sacred Path, guarded by stone warriors and mythical creatures. Art. Nanjing Museum offers exhibits from ancient civilization through the early days of the Republic. At the Cloud Brocade Museum, watch expert craftsmen weave the brocade, incorporating silk, gold, silver thread and peacock feathers, using ancient methods. Cuisine. Nanjing salted duck is the city’s signature dish. Other popular choices include Peking duck, fish and shrimp, pan-fried beef dumplings and sesame pancakes. Over 100 hotels include Jumeirah, Fairmont, Hilton, Sofitel, Renaissance and Westin. Explore China by visiting the vibrant, historic city of Nanjing.